Image courtesy of BDS Planning & Urban Design: Mayor Jenny Durkan is advancing redevelopment plans for the Fort Lawton Army Reserve Center. UPDATE: The Seattle Office of Housing has rescheduled an open house about the Fort Lawton Redevelopment Plan to 5:30-8:30 p.m. Monday, March 4, after this month’s meeting was canceled due to snow. The March 4 meeting is being held in the cafeteria of Catharine Blaine School, 2550 34th Ave. W. Doors open at 5:30 p.m. Public comments will be limited to two minutes. People can still provide written comment at housing@seattle.gov. Seattle Mayor Jenny Durkan has released her draft plan for redeveloping the Fort Lawton site on Magnolia Bluff with affordable housing and added parks space. The Office of Housing prepared the 53-page revised plan after the Seattle Hearing Examiner affirmed it had performed an adequate environmental assessment of the 34-acre Fort Lawton site. The plan calls for Catholic Housing Services to create 85 supportive housing units for homeless seniors and veterans at or below 31 percent of area median income in partnership with the United Indians of All Tribes, and 100 affordable rental units. One unit will be set aside for a site manager. The 100 units will be a mix of one-, two- and three-bedroom apartments for households earning up to 60 percent of median income. Habitat for Humanity will create 52 units of affordable-ownership housing in the form of three-bedroom townhomes and six-unit rowhouses constructed with sweat equity. These units will be available to households with incomes up to 80 percent AMI. To keep these homes affordable, they will not be available for resale for at least 50 years, according to the redevelopment plan. Habitat for Humanity will retain ownership of the land, and lease it to homeowners through a 99-year community land trust that is inheritable and renewable. A homeowners association will need to be formed in the future. The nonprofits were selected for the project in 2008, when the Great Recession hit. The plan calls for conducting a zero-cost public conveyance to the nonprofits. Around 22 acres of new parks and recreation space will be created, which is roughly 60 percent of the site. Seattle Public Schools will use six acres to create two multipurpose fields. The plan is for SPS to be granted the land through a U.S. Department of Education parks public benefit conveyance, or through a sale negotiated with the Army. Plans to redevelop the former 70th Regional Support Command headquarters at Fort Lawton for housing have been stalled for a decade. The Base Realignment and Closure Commission (BRAC) shut the facility down in 2005, and tasked the city with its redevelopment. After a legal challenge required the City of Seattle to conduct a final environmental impact statement for the project, Discovery Park Community Alliance founder Elizabeth Campbell challenged the city’s review. Her group’s lawsuit is what led to the FEIS being required. The Fort Lawton site is currently 55 percent developed with old military buildings, parking lots and roadways. The city is caretaker of those facilities under a five-year lease with the Army, which formally decommissioned the Fort Lawton Army Reserve Center in February 2015. Durkan plans to submit the plan for city council review later this spring. 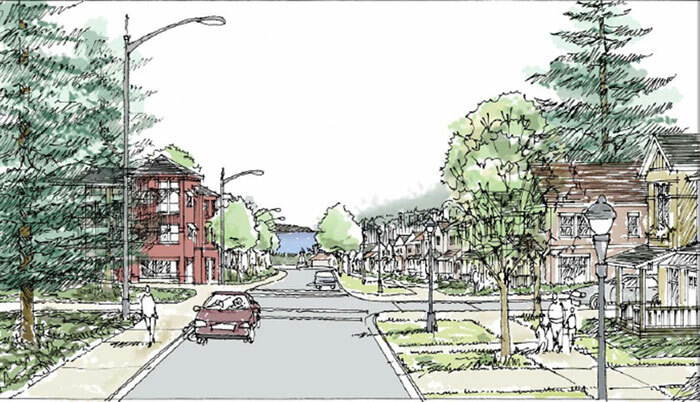 Redevelopment of the Fort Lawton site will also require a rezone of property from single-family to low-rise for multifamily housing, as well as upgraded utilities and other infrastructure. Texas Way will be the main access route to the redevelopment, and will be improved to include two 10-foot-wide travel lanes, and 8-foot-wide parking lanes and 6-foot-wide planting strips and sidewalks on both sides of the roadway. Construction is expected to start after rezoning and property conveyance, likely in 2021, and last through 2026.